Please visit the on-line portion of our exhibit, created by Sharon F. Hess and Katheryn Lawson of the University of Delaware! ​There's a Gild for That! 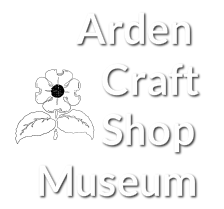 showcases a number of Gilds, past and present and in doing, illustrates the wide variety of talents and interests that bring so much life to the Ardens. ​The Arden Club and its Gilds are an important part of the history of our villages and enrich the social fabric of our community. Economics, theatricals, dancing, and singing were all lively activities when the Gilds began, as they are today. The costumes on display have been loaned by the Shakespeare Gild from their extensive collection. While they have been designed to show the richness necessary to reflect the status of their noble wearers, they also reveal the practicality of designing for the stage. While the gowns shimmer like silk and the embroidery appears to contain gold or silver threads, the materials are, in﻿ fact, hard-wearing modern fabrics. The illusion is created by imaginative designers and talented seamstresses. Fortunately the Shakespeare Gild has always benefited from talented people in both roles. The long Shakespeare tradition in the Ardens is rich with players, back-stage folk, front-of- house staff, and fortunately, costumers. We are pleased to be able to share their history with the audiences at this years’ production. Now--Hei thee forth to the play! Storytellers have long held a central place in the communities that nurture them. Whether they are recounting the brave history of their societies, spinning tales of fun and fantasy, or preserving the wisdom of their time, these tellers of tales are valued for their imagination and wisdom. Not surprisingly, the Ardens have long been home to many authors. While the efforts of artists like painters, musicians, and actors are easily seen, writers tend to lead more isolated lives. We become aware of their work only once it has been published or presented on stage. We must seek out their books, articles, poems, and plays to enjoy their work. Fortunately, in the Ardens, we do not have to search very far to find these talented friends and neighbors. During the research for this exhibition, the Museum & Archives Committee gathered the names of over 45 authors who have lived in the Ardens. Some of these are generally well known, such as Upton Sinclair and Helen and Scott Nearing; some are known within their fields, such as Mike Curtis on Single Tax and Linda Eaton on historic textiles. All are known for the originality and creativity they bring to their chosen subject. In this exhibition, the visitor will find a wealth of knowledge on a wide assortment of topics. In addition to examples of their work, there is a short biography of each author and, when possible, a photograph. Fourteen authors are featured in individual vignettes. Selecting which books to feature is rather like choosing a favorite flavor of ice cream – like the different authors, they are all tempting. We have tried to show the diversity and depth the authors of the Ardens. Of course, there is always much more to learn, to explore, and to enjoy. We hope this exhibition will whet your appetite to discover more about the authors you know and find fresh adventures with new writers and tellers of tales.